On Friday, we shared about gratitude and how important it has been for life the past few months. It has helped us find joy and patience during times when it typically would have been missed. It has allowed us to calmer days and more contentment than ever before. It was cool to catch other people’s lists, thoughts, and images on the idea via our #GratitudeTFE tag on Instagram. We are looking forward to the continuation of the series there if you want to join or follow along! This week we are back at our home in Raleigh and we are settling in here, reconnecting, and finding out footing again after 3 months away. The plants on the back deck need some love, we need to organize and get rid of things, there is a fridge that needs food in it again. There is always a list to come back to whenever you leave and come back. But there is a part of me that loves this process. I love the leaving and coming back and the feeling of hitting the reset button on life. A new season is always an opportunity to hit reset and now that we are beginning the second full week of September and approaching the last quarter of the year, it seems like a great time to hit that reset button. Sometimes the most refreshing thing we can do is reorganize a closet, purge what never was worn, move to a new place, come home, leave home, set new goals, begin a new diet, change a relationship….etc. The list is endless of what may pertain to your life in order to begin thinking of resetting your life in this last stretch of 2016. We would love to hear how you are thinking of resetting life for the new season of both your personal life and business life. Are you setting new goals? Starting something new? Reorganizing your kitchen? Moving? What does this new season hold? 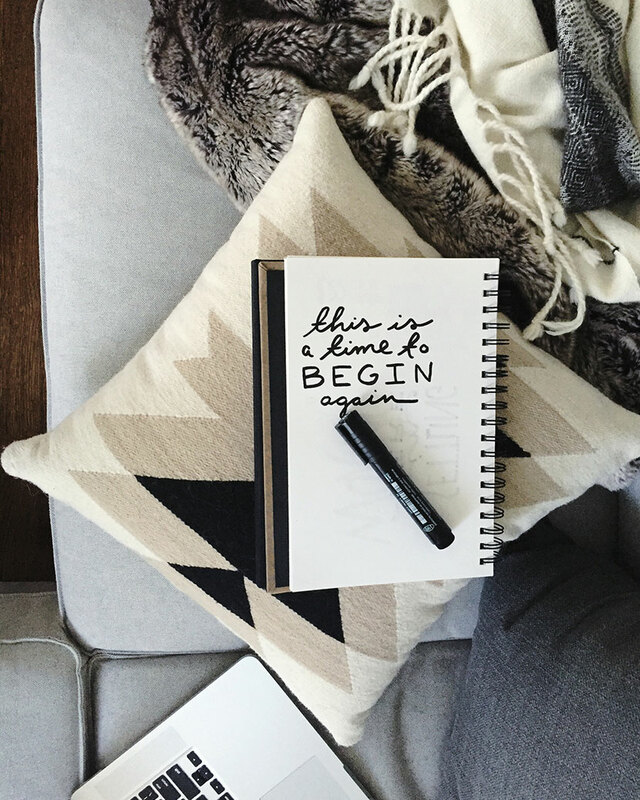 Hitting the reset button is important–and a new season is just the time to do it! Fall for me will be a season of change…with lots of new things on the horizon. I’m excited for all of the changes that are to come. It is my way of hitting the reset button! Happy Monday! I am resetting this season by not looking back and enjoying all things fall: putting away summer clothes, starting to cook fall foods, light a fall candle (oh the smell of this season! ), go apple picking, drink cider, take walks and enjoy the colors…etc. be here in this season with my eyes wide open. i believe when i am in the moment, truly in the moment, things will fall into place. i think some challenges are coming, but it’ll be good. This post is so poignant for me… In two weeks, i’ll be leaving my corporate job to pursue my passions, cuRrently without income and without other job offers. Its terrifying and exhilerating and feels like hitting reset on my whole life. Thanks for sharing your thoughts on the reset of the last quarter! I love the beginning of fall because it’s a good time to stop and consider how things are and plan to make adjustments – in life, in work, at home. Which reminds me … this is something I need to do haha. I’ve been so busy! Just gotta make the time. This couldn’t ring more true for me in this approaching season. I’m re-setting some old goals and taking the plunge back into blogging! i’m going into it with a refreshing outlook and accepting that it may look a little different this time around…and i welcome that! i’m pretty excited to get back into it again and see where it may lead. being able to get my creativity out after having 2 kiddos is something i’ve come to realize is incredibly important for my well-being! I just came across your blog and it is quite inspirational! thank you for that. best wishes.